They make phenomenal (and angry-looking!) cymbals. Give a new dimension to “cut my life into pieces”! The bowl has a crack, a huge hole in the middle, and still incredibly sharp edges. I am trying to imagine what to use it for. No more carelessly reaching for another handful of snacks, I guess. This is why I enjoy r/diwhy. I have just spent an hour there, and I feel that most of my brain has left my body. The large one is used to hold nespresso coffee cups in the office, and when it runs out, fruit. Hole is not a problem at all. The smaller one has a closed bottom, and is now a jewelry tray. Both were gifted, and recipients love them as they have a incredibly industrial look, but are actually very pleasant to hold and handle. The surface is very smooth, and the hammering gives it a very organic texture. They are coated with beeswax, are nice to the touch and they feel incredibly solid. There’s an opportunity here to figure out what happened to those carbide cutting tips. Certainly they fell off, but then what happened to them? Can you find them in your forge? They might be a little magnetic, because of the cobalt, so if your forge is anything like mine, with a fire-mortar lining, you might be able to fish them out with a strong magnet. A form of folk artwork, I suppose. I’m a different stroke for different folks,sort of person, but I would have it toss it on the scrap iron pile. Well, as the saying goes, one mans garbage is another mans gold. And, sure, this is not the kind of esthetics that appeals to everyone. But if you are into industrial styling, this is just perfect on a table as a fruit bowl or so. I have people begging me to make them one as well, and have trouble finding enough discarded saw-blades :) Luckily, somebody just gifted me 20+ really old blades, so there will be a bunch more coming! A couple of points: the saw blade did not need to be annealed before working, unless it was going to be worked cold, like copper or silver (which is generally not done with iron). 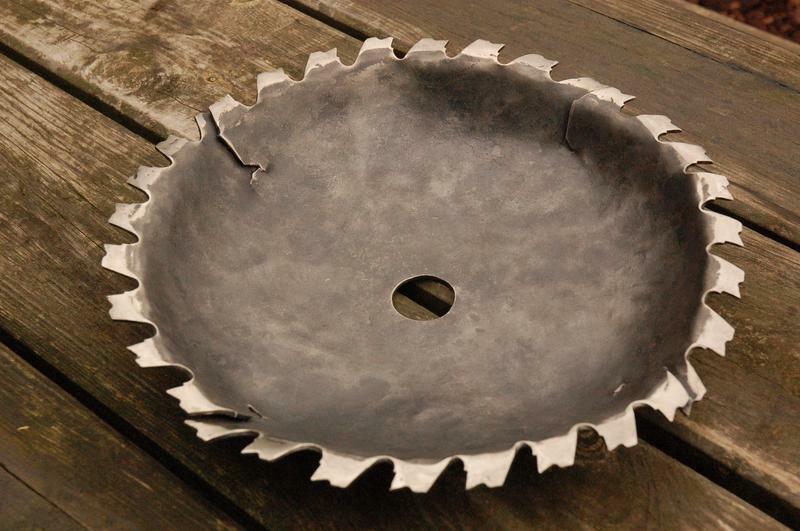 A saw blade that was annealed would be no different to work than one that one that was not. Secondly, a blacksmith should be cognizant of what they are working on. Everyone knows the dangers of heating beryllium copper, or galvanized metal, but tungsten carbide, and more importantly the sintering compound used to bind it present heavy metal hazards for inhalation, and putting something like that in a forge without removing the carbide cutting tips is asking for trouble. This kind of exposure is cumulative, and it is worth every effort to work safely. The blade he used had carbide cutting edges attached to the tips of the teeth, and those teeth are clearly missing in the final product. That is probably only relevant for workers working regularly with powdered tungsten carbide. It is difficult to imagine, that the solid chunks on the saw blade could do other damage than mechanical. When the melting point is probably in the range of 4000°C. I don’t always pump liquid tungsten carbide, but when I do, I pump it automatically from drums to the process container. Yes, it’s a little stupid to be concerned about the tungsten carbide. I was talking about the sintering compound. Note “brazing, welding”, which are both done at temperatures considerably lower than 4000 celsius, and the exhaust of a coal/coke or propane forge, especially with amateur blacksmiths, is seldom contained in a flue. You inhale what your forge exhales, to a greater or lesser degree. There is enough pulmonary hazard from the fine particulates from a forge: there’s no reason to make it worse with cumulative heavy metals. The experimenter and the maker expose themselves to hazards that philatelists and skiers are not susceptible to, and a little extra caution is often warranted. really old idea but still neat. most of the ones i see and have use an old plow disc cleaned up. They also make wonderful axes and hatches when heat treated cut and ground.